The sermon in the Children’s liturgy contained something for all children of God – we are children of the light – it is really THAT simple. This is from yesterdays reading, which was read in the so-called “Children’s liturgy” this week. 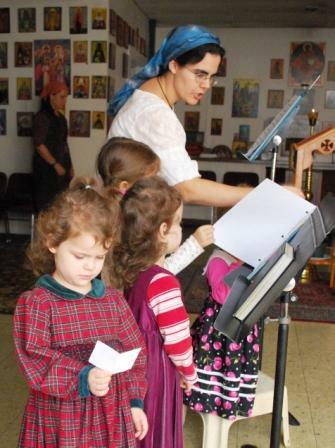 Twice a month, on the 1st and 3rd Thursdays, I serve a “children’s liturgy”. This is really nothing more than a liturgy that many of the parish children attend, with a sermon especially for them, on their level. Also, the children are encouraged to sing as much as they are able, and they do sing, like angels. Eventually, God willing, the children will become the entire choir for these liturgies and read the epistle. I have a fervent desire also that eventually our children’s liturgies will become a weekly affair, and part of a homeschooling curriculum. I envision the church as providing significant resources to homeschooling parents, in an organized, but unofficial way (we probably will not an official school, with all the red tape and state interference that this would entail.) I believe that as a pastor I must try to equip our youth as best as I can, and it is my strong opinion that homeschooling is preferred unless there are extenuating circumstances. I believe the church must help equip parents to home school their kids. This is one the of the greatest reasons why I want our parish to grow. 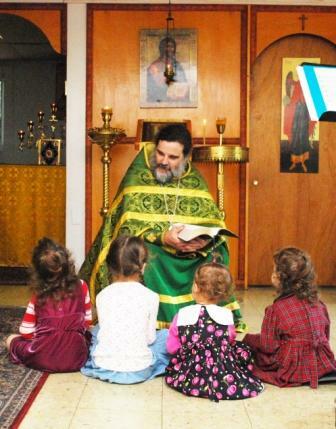 The children’s liturgy is one of the highlights of my life, not ALL of it mind you, because children can sometimes be, well … children, but in general I am filled with great hope during these liturgies. Hearing the children sing, generally on key, but usually with a little … improvisation … always warms my soul. I cannot think of a more important 2 hours during the week. One of our “traditions” is the children’s sermon. I sit on a little stool,, and talk to the children. I usually talk about the Gospel of Epistle we just read, and try to put it in terns they can understand. They all gather around in a semi-circle, and are very interactive! Here was the simple message yesterday: “You are children of the light”. I went on to ask them if they would rather be in light or darkness, and told them that light means holiness and darkness is sin. They made the connection that when you sin you are in darkness, and wondered how you get back to the light. Don’t tell me that you cannot talk about theology with children! Of course, the answer is to repent, and ask forgiveness. In their case it may be that they must apologize to a sibling, or tell their mommy they are sorry. This was a simple sermon, for children, and it was well received. There was a lot more to it than I am recounting, because there are always a few tangents that are suggested by the audience, and I think a pastor giving a sermon to children breaks the lawyer’s number one rule: always know the answer you will be given to every question! After the liturgy, I kept thinking about this simple sermon. This concept is not only for little children, but the big ones too – all children of God. Is we remembered that we are “children of light” at all times, we would be protected from sin. It really IS that simple. It is a powerful and simple idea – “I am a child of light – I will not do this or think that because it is darkness and not light” The scripture is full of short powerful phrases that can keep us from sin if we are attentive. Another one is “You were bought with a price”. Perhaps we may not sin for no other reason than gratitude when we remember this. It is critical that we remember what our purpose is. We are his workmanship, created in Christ Jesus unto good works. We are children of light. Let’s remember this at all times. By the way, this is a simple but not easy concept. After the sermons, during the rest of the liturgy, the children bickered more than usual. Sigh. 1 Thessalonians 5:1-8 1 But of the times and the seasons, brethren, ye have no need that I write unto you. 2 For yourselves know perfectly that the day of the Lord so cometh as a thief in the night. 3 For when they shall say, Peace and safety; then sudden destruction cometh upon them, as travail upon a woman with child; and they shall not escape. 4 But ye, brethren, are not in darkness, that that day should overtake you as a thief. 5 Ye are all the children of light, and the children of the day: we are not of the night, nor of darkness. 6 Therefore let us not sleep, as do others; but let us watch and be sober. 7 For they that sleep sleep in the night; and they that be drunken are drunken in the night. 8 But let us, who are of the day, be sober, putting on the breastplate of faith and love; and for an helmet, the hope of salvation. James 1:23-24 KJV For if any be a hearer of the word, and not a doer, he is like unto a man beholding his natural face in a glass: (24) For he beholdeth himself, and goeth his way, and straightway forgetteth what manner of man he was. [U1] < title> Ye are all the children of light, and the children of the day: we are not of the night, nor of darkness. Children’s liturgy and children’s sermon. This entry was posted on Friday, November 20th, 2009 at 5:21 am and is filed under Epistle:1 Thessalonians, Pastoral Journal, Scripture Commentary. You can follow any responses to this entry through the RSS 2.0 feed. You can leave a response, or trackback from your own site. Sounds like my girls : ). Very nice, Father. A wonderful pastoral witness. I wish to receive mail on the above emailID on Children’s Liturgy for the day or if not then at least for each Sunday as I help in the Church for preparing the children and training them for the Liturgy.